This Hot Mocha Pudding Will Leave You Sizzling! 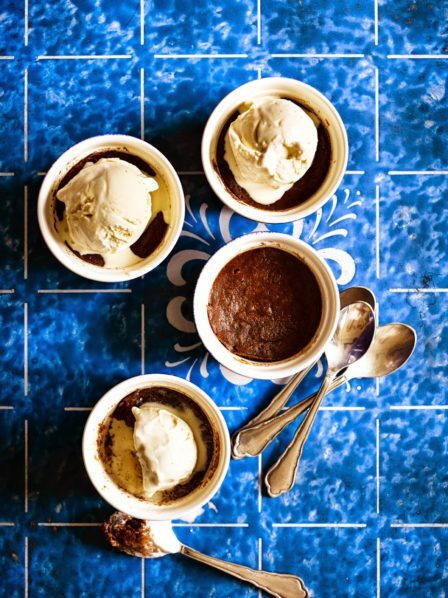 Topped with ice cream and liqueur, this recipe only takes a few minutes to mix, microwave and prepare for a rich, indulgent dessert. Blend the milk with the prunes and coffee in a food processor until smooth. Add the butter, sugar, egg, almonds, cocoa, flour and a pinch of salt, then blitz again to form a thick batter. Scrape evenly and cleanly into ramekins. Space the ramekins around the edge of the microwave turntable and cook on medium for 6 mins for a slightly moist pudding. Stand for 5 mins, then serve topped with a scoop of ice cream and a little liqueur.